While examining an 18th century(?) copy of al-Barrādī’s Kitāb al-jawāhir, I encountered an unexpected resident: a bookworm. Now, I have certainly read about ‘bookworms’ and have often seen the results of insects feasting away at manuscript book pages–cursing them in absentia, of course–but was nevertheless surprised to see one, living and breathing (and eating), inside a manuscript before my very eyes. 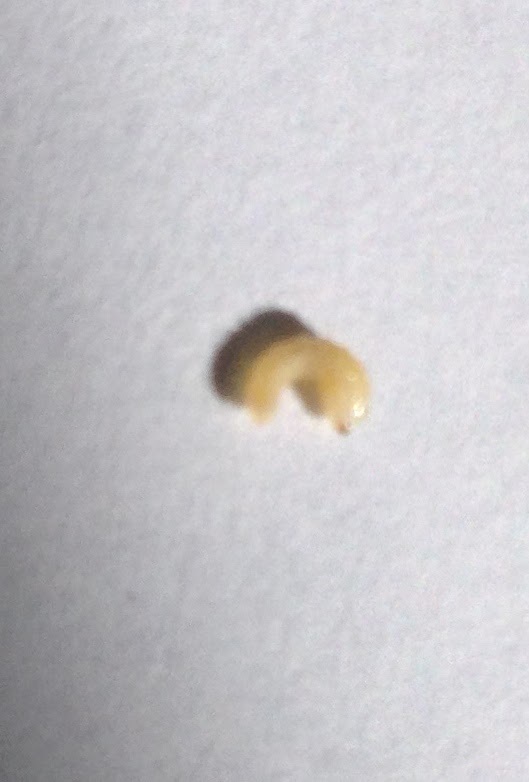 This tiny white larva (bookworms are not actually worms) was difficult to photograph. But I tried and then tossed him into the garden. I suspect he was a beetle larva from one of the many types of beetles here on the island. This experience was a reminder to me of the importance of preservation and the logistical difficulty of protecting a large collection of old books on a Mediterranean island.